Although practising as an architect, Moore also maintained his career as a painter. Like his fellow artists in the Contemporary Group founded by George Lambert and Thea Proctor, he contributed to the development of the modern movement in Sydney through an approach which emphasised formal construction. 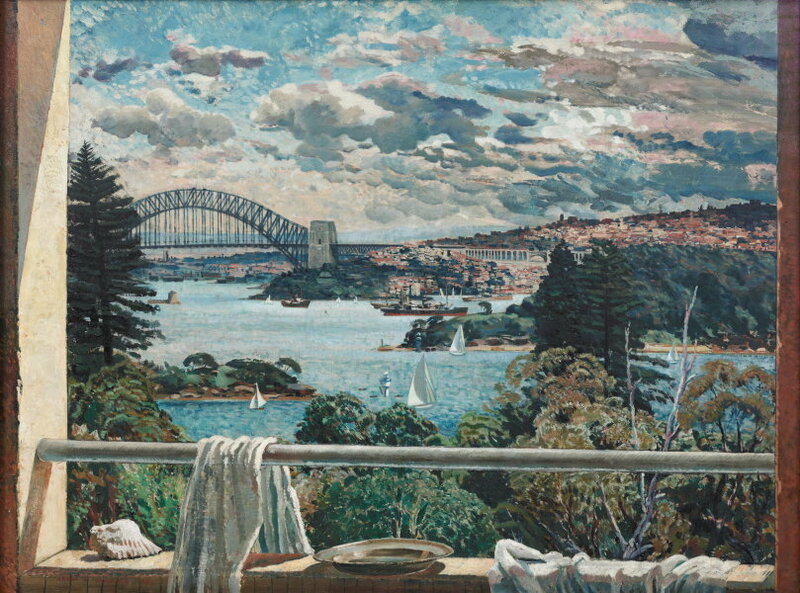 Using the framework of architecture, Moore's view of 'Sydney Harbour' was taken from the balcony of his house in the eastern Sydney suburb of Vaucluse. His well-regarded landscapes, more often in the medium of watercolour, arose from a love of sketching out-of-doors and for the watercolours of English artists John Sell Cotman, Constable, James Innes and Wilson Steer. Signed and dated l.l. corner, brown oil "JOHN D MOORE 36". Caroline Butler-Bowden, Sydney moderns: art for a new world , 'Art deco, modern life and the internationalism of Sydney', pg. 140-143, Sydney, 2013, 141 (colour illus. ), 217, 314, 323. Alan Close, Reader's Digest , 'Ode to Sydney', 29-31., Sydney, Sep 2000, 29 (colour illus.). Alan Close, Good Weekend , 'Ode to Sydney', pg. 55-56, Sydney, 15 Apr 2000, 55 (colour illus.). Peter Emmett, Sydney: metropolis, suburb, harbour , 'Harbour', pg. 123-124, Glebe, 2000, 151, 152 (illus.). Bruce James, Art Gallery of New South Wales handbook , 'Australian Collection: Painting and Sculpture', pg. 102-181, Sydney, 1999, 145 (colour illus.). 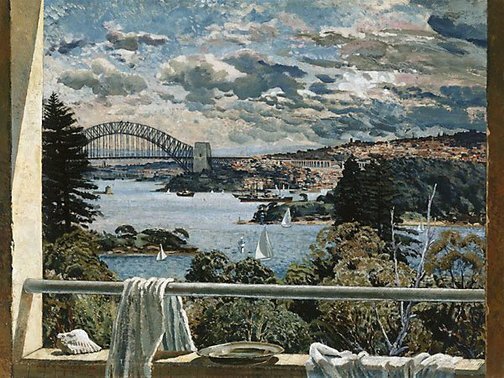 Barbara Konkolowicz, Look , 'Big Blue Sydney Harbour Through The Eyes of Artists', pg. 20-21, Heidelberg, May 1997, 20 (colour illus.). Barry Pearce, Australian art: in the Art Gallery of New South Wales , 'Earth, sky and paint', pg. 149-150, Sydney, 2000, 152 (colour illus. ), 301. Big blue: the painted harbour (list of works) , Sydney, 1997. Australia Land of Contrasts , Sydney, pre 1949, (colour illus.). The Home annual: Australian life and scenery , Sydney, Oct 1938, 29 (colour illus.). Art in Australia [series 3, no. 70] , Sydney, Mar 1938, 35 (colour illus.). Expanse: Aboriginalities, spatialities and the politics of ecstasy , Adelaide, 1998, frontispiece (colour illus. ), 26. Thoroughly modern Sydney: 1920s and 30s glamour & style , Sydney, 2006, 10. List of works.